The Swans Official sponsors BetUK.com are running a competition to win two signed Swansea shirts for two lucky winners! 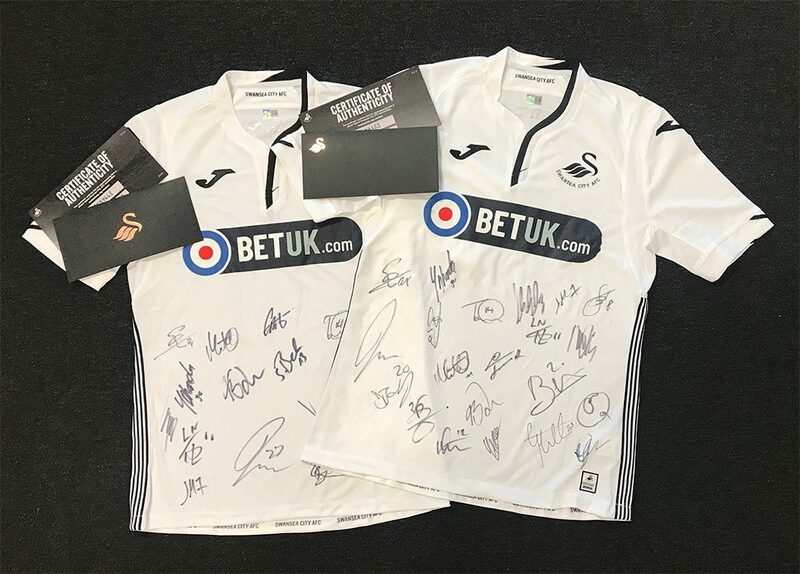 The two signed Swansea shirts up for grabs have been signed by all First team players this season and come with authenticity cards. To enter the competition, all you have to do is register an account with BetUK.com before the competition closes on Sunday 9th December 2018. If you enjoy sports betting, then now may be a good time to sign up as BetUK are offering new customers £5 + 10 free spins when they bet £5. Terms and Conditions apply. All players must be 18+. Gamble Aware aims to promote responsibility in gambling. For help, support and advice about problem gambling please contact the National Gambling Helpline on 0808 8020 133. The following terms and conditions apply to this competition, so please read them before entering. This promotion begins 00:00 Wednesday 28th November 2018 and ends at 23:59 Sunday 9th December 2018. Only one entry per user is allowed. The prize is to win a first team signed Swansea AFC football shirt. Two winners will, be picked at random by BetUK after the close of the competition. The competition winners will be notified via the email they have used to register an account with Bet UK. The winners must respond within 24 hrs to accept. If the prize isn’t claimed another winner will be selected at random. No prizes will be awarded to employees, (and their families), agents (including advertising agencies and promotional companies) and successors and assignees of the Leo Vegas group and its contractors. Players must be resident of the UK, Isle of Man and Channel Islands. Bet UK may, at their sole discretion, limit the eligibility of customers to participate in this promotion, for any reason whatsoever without notice to the end users. No correspondence will be entered into. Bet UK’s decision will be considered final in the event of a dispute.